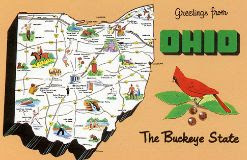 f you put all of Ohio's homeless people in one place, it would be the seventh largest city in Ohio. That caught your attention, eh? Same thing happened to me earlier this week when I read a similar headline. That's a lot of people, I thought to myself. See - I was familiar with Ohio's homeless counts. I'd read the statistics, I knew the numbers were growing. But to think that all of those without a home could fall right between Dayton and Parma to be the 7th largest city in the entire state? That gave the number a whole new meaning. This got me thinking. As homeless numbers continue to grow this winter, it's absolutely necessary to report the statistics. But perhaps equally critical is giving these numbers some kind of context that's easy to grasp. Something that's representative of the scope of the problem. Something to catch people's eye and force them to pay attention. So 150,000 homeless people in Ohio? Why that's the population of Chattanooga, Tennessee. Or the amount of money spent on Sarah Palin's clothes by the RNC during last year's presidential election. Or the number of people who get cancer in Turkey each year. Yes, the message is important. But how we say it and put it in context cannot be ignored, either. How would you quantify your community's homeless population in a way that is interesting and eye-catching? Leave it in the comments below.